Modern civilization is aimed on increasing the convenience of people in all areas. However, increasing of someone comfort can lead to a decreasing in comfort someone else. A striking example of this is playing and listening of music. Someone like opera, but opera can presses on nerves to other person. To avoid such nuances, and with purpose to make listening of the sound information more comfortable and accessible, were invented special devices, which are called the headphones. Our language today will be about the best headphones for computer, phone, Mp3 player or other device and how to buy them. Headphones (headsets) are a special acoustic device for listening of audio information that is placed in close proximity to the auditory organs. Simply, it’s small speakers that are placed on or inside the ears of the listener. As mentioned above, the audio headphones can be placed on the ears or inside of them. Accordingly, they are such headphones types: On-Ear and In-Ear headphones. On-Ear (external, over-ear) earphones placed on the ears, they are larger and can be of two types: the encompassing (closed) and a patch (open). Closed headphones completely cover the ear, that helps transmit sound better and obtain better sound insulation. Open headphones cover the bulk of the ear. They sound a little worse, but they are more compact. In-Ear headphones. These headphones are inserted directly into the ear (ear canal) of listener. This placement provides a fairly good sound transmission and high degree of insulation from external noise. While sound transmission of the on-ear headphones is still better, because they use larger membranes. Instead in-ear headphones are much smaller and sometimes almost completely invisible. To the question: “what type of headphones to choose?” We can answer the next – if you want to listen music at sport trainings or somewhere on the public – it is better to choose small in-ear headphones, in other cases it is better to choose on-ear models, because many doctors say that in-ear headphones have a negative impact to the hearing system, and damage from these headphones can be greater than from on-ear phones. About the frequency we have mentioned already in the article about how to choose the acoustic system. Remember, that a man can hear sounds in the range of (16) 20 Hz to 20 kHz. Normal headphones sound should play at least a range of 30 to 17,000 Hz, and preferably from 20 to 20,000 Hz. Higher indicators of headphones frequency it is mostly banal advertising moves that make manufacturers of headphones. Sensitivity indicates the possible strength of the sound when using certain electrical power. More sensitive headphones will give a stronger sound using equal power than less sensitive. Preferable headphones sensitivity is 100 decibels approximately. Resistance affects the headphones sound quality. The higher indicator of resistance supplies the better quality sound you hear, but this will require greater energy consumption. In the other way – headphones are often used with some other devices that run on batteries very often, so the resistance must be optimal to have enough batteries power to longer using. For the best portable headphones (used with portable devices) we can recommend this index within 16 Ohm. Stationary computer headphones or other fixed impedance headphones may be with 32 ohms or more resistance. Length of cord. The length of the cord depends on headphone comfort and the possibility of their use in certain circumstances. Choose it length for reasons of how you plan to use the device. If you buy the awesome headphones to your computer – choose cord from 3 meters. 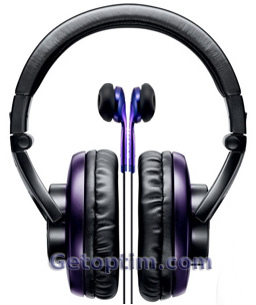 If you want to use fashion headphones with Mp3 player– then take a shorter cable. By the way, there are wireless headphones, which work mainly with Bluetooth and without any cables. Microphone availability. If you want to buy a headset only to listen something – you do not need a microphone. However, if you want to chat on Skype or somewhere else, choose a headset with microphone. Weight and ergonomics of headphones. Clearly, acoustic headphones cannot weigh 10 kg, but if their weight is not comfortable, your ears and head will be hurt after some time. Also the form of headphones can be not comfortable to you, so it is better to try on same model to you directly. We should also note the following trend: many well-known electronics manufacturers (Panasonic, Logitech, Philips and others), in addition to other equipment, also produces headphones. These products are mostly of the lower or mid-range price category and have a normal quality. However, if you want to buy cool professional high quality headphones, turn your attention to production of specialized companies, such as Sennheiser headphones or other. Well, here briefly how to choose the most comfortable headphones. Hopefully, the article will be useful to you. I like headphones with with Bluetooth – very useful for me. Ya,headphones with Bluetooth – super! It was really nice how you suggested determining the length of the headphone cord needed before getting one because that can contribute largely to the convenience of the user. I am pretty sure that we will need headphones with long cords then since students will be using them. Sometimes they have to stand up and move to check something out, so they need a pretty long cord. Thank you for sharing.